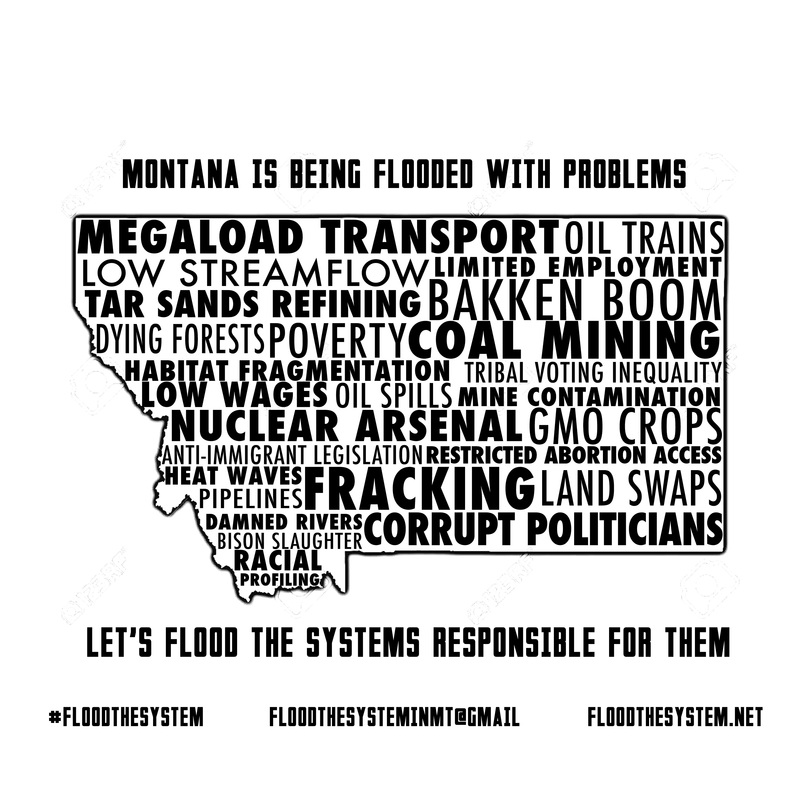 On Saturday, August 29th, Northern Rockies Rising Tide along with Blue Skies Campaign and other groups around Montana are kicking off a season of nonviolent action to break our addiction to fossil fuels — and we need you to help. 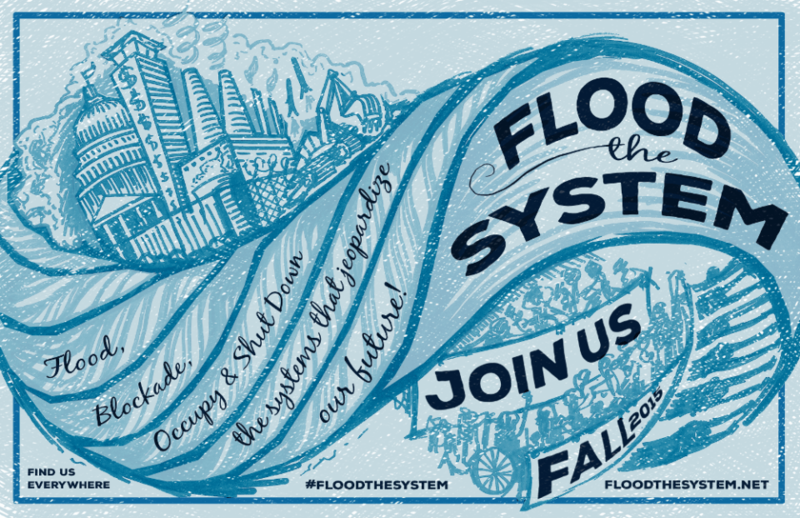 Over the course of the fall local organizers and climate activists will be participating in Flood the System, a nationwide effort to scale up the climate movement before this December’s UN climate change negotiations in Paris. We’re planning a series of nonviolent actions in cooperation with other groups, starting with a statewide day of action this Saturday. In Missoula, Blue Skies and other groups will hold a Climate Bike Ride, a mobile protest against fossil fuel industries and other institutions that contribute to the climate crisis. The ride starts at 1:00pm at FreeCycles (732 S. 1st St. W.), and should finish around 2:30-3:00. In Bozeman, concerned citizens will hold a rally for climate solutions in front of the County Courthouse on Main St & 3rd Ave, from 1:00-2:00pm. Please come and feel free to bring your own sign. In Great Falls, members of the community will gather for a picket protest outside the Calumet oil refinery (on the corner of Smelter Ave & 10th St NE) from 10:00-11:30am. Meet across the street from the refinery in the Montana Club parking lot, and bring a sign if you can. By participating in any one of these events Saturday you can help start this fall’s season of climate action off on a strong note, and you’ll also get a chance to learn more about Flood the System and other events coming up later this fall. Please join us in the streets! MISSOULA – A 71-year-old woman was arrested early Wednesday morning for disorderly conduct at a protest against the megaloads passage. 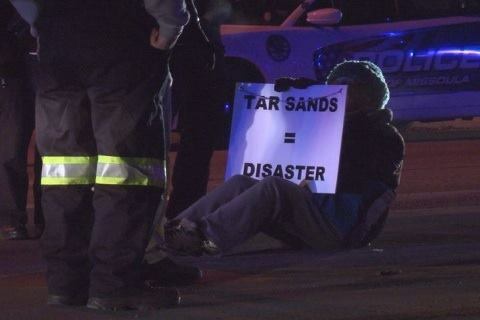 The incident happened around 12:30 a.m. when a group of about 30 people took to the streets and halted the 350 foot long piece of tar sands equipment near the intersection of South Reserve Street and Spurgin Road. The delay lasted about five minutes before police ordered the demonstrators off the street. A spokesperson for Indian People’s Action says the effort was aimed at raising awareness of about the impacts of tar sands oil – on public and Indian Land. 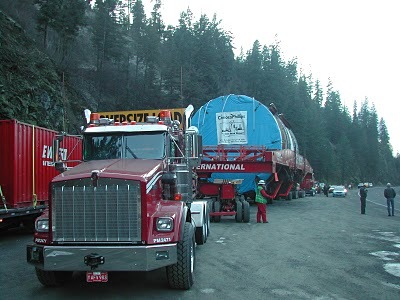 “It’s not a future issue, it’s causing the land to be inhospitable, both on the reservations and for the surroundings area… There’s no way we’re going to change the surrounding area once it’s destroyed,” said Indian People’s Action Media Liaison Naomi Odermann. Missoula Police tell us the woman was cited and released.